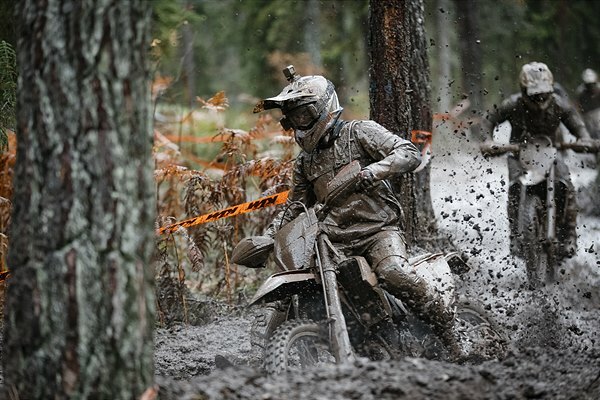 The Gotland Grand National, known for its tough, slippery terrain, didn’t disappoint as overnight rain turned this year’s track into a mud bath. The 22-kilometre course proved to be hugely challenging for all riders with the near-zero temperatures adding to the difficulty. With 3,000 riders taking to the start, getting out in front early on was key to a good result. Taddy Blazusiak, riding his first ever Gotland Grand National, made a good start to clear the huge pack of riders and was able to push hard to try and catch the leaders. A couple of small mistakes mid-race cost the experienced Polish rider some time, but using his skill and pace Taddy was able to fight back to claim a strong fourth place. The 690 championship points he earned elevate Blazusiak to fourth in the provisional WESS standings with one round remaining. Following his win at the previous round at Hawkstone Park, Josep Garcia came to Sweden with his confidence high and aiming for another top result. The young Spaniard started well but a couple of crashes caused him to drop down through the field, making it necessary for him to pass a large number of riders while battling through the tough Gotland weather. Arriving at the finish in a creditable 12th place, Garcia was pleased with his day’s riding but disappointed not to have maximised on his pace over the three-hour event. Similarly, to his teammate Garcia, Nathan Watson suffered a crash early on that caused him to drop down the order. Fighting back and enjoying a strong second half of the race, the British rider overcame the wet and cold to ultimately place 15th. His result moves him up to sixth in the provisional WESS standings with arguably his strongest race of the season left to contest – Red Bull Knock Out. The World Enduro Super Series concludes with round eight, Red Bull Knock Out in The Netherlands, on November 10.